A wedding veil is not a must-have but definitely a good-to-have piece to complete your glam look. As much as it adds sweetness & elegance into one’s look, it has a greater significance of symbolising the bride’s purity. Times have changed and you are no longer limited to deciding the length of the traditional white translucent fabric only. There is an increasing number of designs popping up in the market and making its appearance on the fashion runway so if you’d like to, by all means, switch things up a little! Injecting some colours to your veil helps to imbue it with some fun elements and vitality – best suited for a wedding with a colourful palette! For a minimalist and elegant look, pick one with classy, intricate lace embroidered on the edge of the veil. Alternatively,a piece that is adorned with crystals, beads and pearls would give you the sophisticated and maxed-out glam look. Besides your carefully picked wedding gown, make your veil the star of the show too! Scroll through what we have gathered for you for some veil inspirations. Bask in one of these unique veils and wow your guests with an unconventional veil on your special day! Looking for a wedding dress to match with your veil? 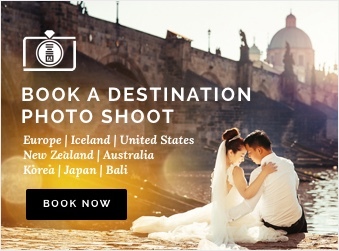 A photographer to capture all your precious moments? Check out the photography packages on our website today!